At last my disc arrived, only two weeks after it was posted — well done, Royal Mail — so here is my cover for Meglos. Download here and read about its creation here. And I haven’t even watched the programme yet! Frustratingly, my copy of Meglos hasn’t turned up yet, despite being posted over a week ago, so I won’t be able to finish the cover this weekend. Instead, here’s my revised cover for the extras-laden re-release of The TV Movie. Download here and read about what I changed and why here. Talons and Androzani will follow in due course, as will further Revisitations re-issues, with greater or lesser changes depending on how I feel about the original covers ten years on (goodness, has VJ been going that long?). Stay tuned! And with that I’m finally up to date with all the DVD releases — for all of six hours! My copy of Meglos hasn’t arrived yet but I have most of the illustration planned out so will get to work on it as soon as possible. I hope you’ve enjoyed the wealth of covers over the last few months (and the calendar), and to all those who do wrap them around their DVDs, thanks for your support and I hope you like 2011’s batch of covers. As ever, do please let me know what you think — what’s your favourite cover, which style of composition do you think works best, if you’ve used them for your collection send me a photo — all feedback is most gratefully received. Just squeezing in before midnight again (this is becoming a habit! ), here’s my latest cover: The Monster of Peladon. Download here and read about my thought processes in designing it here. So close to catching up now. 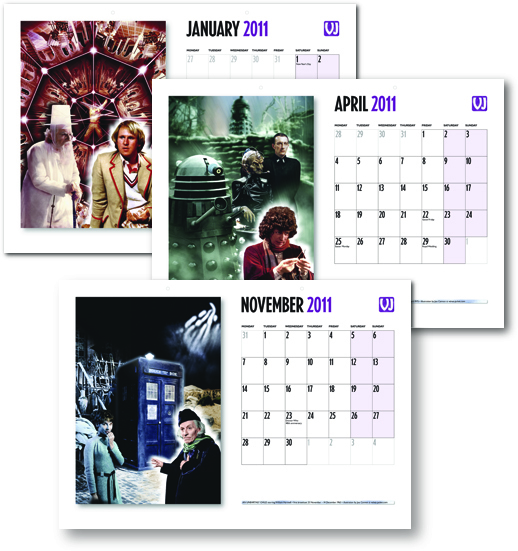 With three (and a half) covers completed in just over a week (plus a calendar!) I’m sure you’ll appreciate my efforts to get up to date as quickly as possible without compromising the quality of the covers. Indeed, Monster came together in just one (long) day once that bolt of inspiration had struck, so it’s not impossible I’ll get Revenge of the Cybermen done tomorrow should lighting strike twice. If not, at least Meglos isn’t out until next Monday, so I have the weekend to finish things off. Happy New Year, everyone. As a bit of fun, I thought I’d produce a Velvet Jacket calendar for the year ahead, to showcase some of my cover artwork free from logos and text. Click here for details of how to download (be aware, big files! ).